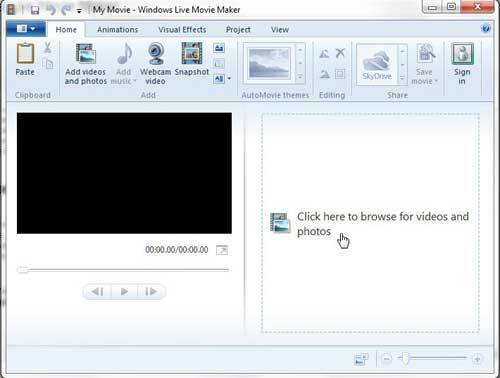 Windows Live Movie Maker is the video editing program that you can download for free with your Windows 7 license. It is included as part of the Windows Live Essentials suite of programs, and offers you a number of accessible, helpful tools for making adjustments to your video clips. While many of the changes you can make through the program are self-explanatory, you may discover issues when you attempt to accomplish certain tasks. This is especially true of some of the more complex adjustments you can make to your videos. 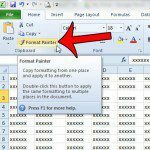 For example, you might have difficulty learning how to flip a video clip in Windows Live Movie Maker, because there are no explicit buttons or tools that are dedicated to that task. 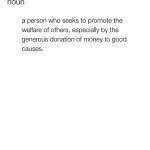 However, you can use the Rotate utility to accomplish the effect. Editing video with Windows Live Movie maker is meant to be as simple as possible. The program’s layout is similar to many other Microsoft programs, such as those included in Microsoft Office, and the options are all laid out in the ribbon navigation system at the top of the window. 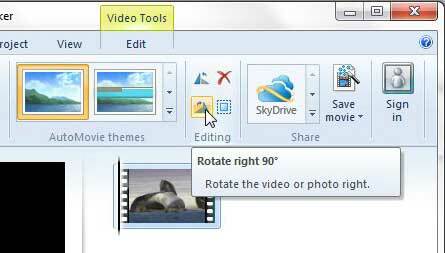 This is where you will be going to flip your video clip in Windows Live Movie Maker. 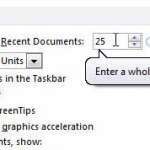 Step 1: Begin by launching Windows Live Movie Maker. This is done by clicking the Start button at the bottom-left corner of your screen, clicking All Programs, then clicking Windows Live Movie Maker. Step 2: Click the Click here to browse for photos and videos link at the center of the window, then double-click the video file that you want to flip. Step 3: Click the Rotate right 90 button in the Editing section of the ribbon at the top of the window to rotate the video 90 degrees, then click it one more time to rotate the video to 180 degrees from its’ original orientation. Note that you can apply this effect to only one part of a video clip, if you so choose. This will require you to split your video file into separate segments. To learn more about how to accomplish that, you can read this article about some basic Windows Live Movie Maker options.